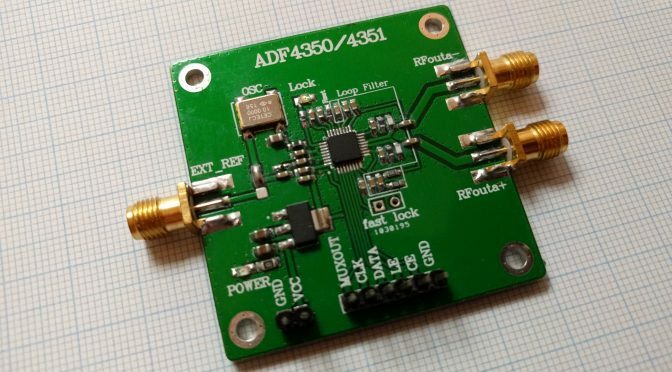 It seems the ADF4350/ADF4351 is a versatile little RF synthesizer, ranging from low VHF to well into the microwave spectrum. The are quite a few articles describing projects using the ADF4350 or ADF4351, and a few that publish firmware files for diverse MCUs that can control the synthesizer, but no I haven’t been able to locate open source control software that can be easily adapted to suit the various project this thing can be used in. I have purchased two different modules off eBay to experiment, and tried it with different software. The most promising library looked to be this one: https://github.com/JQIamo/ADF4350-arduino. Unsure why, I was not able to get it working. Meanwhile I have been keeping an eye on a very good looking project called ZLPLL (https://zl2bkc.com/projects/zlpll/). When it came back in stock, I quickly ordered one. This one seems like a very high quality board with configurable firmware that can be controlled in many ways. ZL2BKC was kind enough to give me access to the firmware for personal experimental use, and using it I was able to get the eBay modules working. The ZLPLL firmware, though, is part of a commercial product, and I will not be sharing it further as per my agreement with the author. I might, however, be able to work out what the Arduino library is doing wrong and bring it into working order. Not yet, unfortunately. I expect to get more time for this during this fall. besides the one from SV1AFN i am also using the chinese board according to picture above. Sorry for not noticing this comment for so long! I have both 4350 and 4351 modules. I’ll have a look! Cool! I’ll have a look! Sorry, link i did mention 2016-08-27 hasn’t been correct. but meanwhile this also has been corrected by hans-1.